September 16th marks just 50 short days until Election Day. 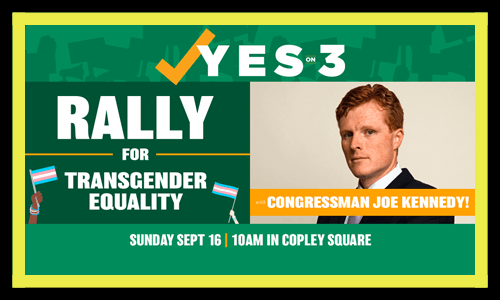 The “Yes on 3” campaign to protect trans rights in Massachusetts, of which Boston Pride is a coalition member, invites you to join a massive rally in Copley Square tomorrow. The event starts at 10am and will feature Congressman Joe Kennedy as guest speaker. For more info, click here.